One of the areas of the planet hit most obviously and hardest is our coastal coral beds that house a wonderfully complex and diverse mix of life, some of which sustains humanity. The increasing acidification and warming of the ocean is bleaching virtually all of the major coral areas. Heroic efforts are being made to replant the damaged areas with baby coral while realizing that coral grows Very slowly. Here’s what’s happened with the project on the Great Barrier Reef. The plight of the Great Barrier Reef is becoming more and more like a plot-line from a science fiction dystopia. Following the heat exposure-induced death of half of the reef’s corals in 2016 and 2017, the survivors aren’t having enough babies to repopulate the ecosystem. In fact, rates of “larval recruitment”—the number of new baby corals settling on the reef—were down 89 percent in 2018 compared with historic levels, according to research published Wednesday in Nature. And the sorts of coral larvae that did settle on the heat-ravaged reef that year were dramatically different than in years prior to the die-off, suggesting climate change is pushing the 1,400-mile-long ecosystem in a new direction. The researchers compiled data on the type and number of adult corals and new larvae (as measured on standardized collection panels set out on the reef for baby corals to latch onto) from 47 locations in various years from 1996 to 2016. In 2018, following the mass mortality event of the previous two years—which was driven by elevated ocean temperatures caused by the one-two punch of a powerful El Niño and climate change—they returned to 17 locations along the reef to collect the same data. The patterns the researchers saw in terms of lost reproductive capacity, both across space and across species, tracked the deaths of adult corals. On the spatial front, the northern two-thirds of the reef suffered the brunt of the recent heat waves, and that’s where baby apocalypse was concentrated. Three sites at the southernmost extent of the Great Barrier Reef were the only ones where larval recruitment was unaffected. Some larvae, those produced by “spawners” which jettison their sperm and eggs to fertilize in the open ocean, are able to travel up to a hundred miles before settling out. 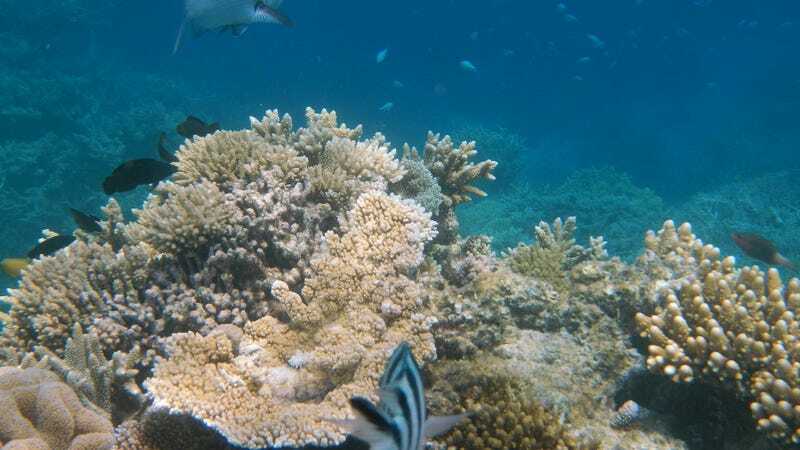 Unfortunately, the size of the Great Barrier Reef effectively prevented southern spawners, including the branching and table-shaped Acropora corals that provide the reef with much of its 3D structure, from repopulating hard-hit reefs at a distance. And it’s those Acropora corals that suffered the highest mortality rates in the north due to their acute heat sensitivity. Unsurprisingly, this group also struggled to breed the most, with the number of new baby corals in the genus down 93 percent compared with previous years. This brought overall coral replenishment way down, as the Acropora are typically quite prolific. And it allowed the stony pocilloporid corals, which Hughes described as “weedy” and “not very good at providing habitat” to supplant them as the primary baby-makers for the first time in the researchers’ records. This shift, Hughes said, is likely to contribute to the long-term degradation of reef. “A reef dominated by pocillopordi is flatter, it has lower biodiversity,” he said. Although not included in the new paper, the researchers returned in 2019 and found that larval recruitment levels for the Acropora genus were still very depressed. The only bright spot in this rather dismal picture is that the southern third of the Great Barrier Reef remains unscathed for now. But it may only be a matter of time before that changes. While the Great Barrier Reef has experienced four heat-induced bleaching events in the last 20 years, scientists have predicted that such events could occur annually by mid-century under a business-as-usual carbon emissions scenario. Previous Post Gmail has made useful changes — check them out!